The Game of Numbers is an exclusive THW series looking at upcoming milestones around the NHL. Each team will be looked at individually in three parts – individual player milestones, franchise player milestones, and players that rank in the top 100 in NHL history in any big statistical category. Edmonton’s been disappointed with the their annual outcome since losing in seven games to the Carolina Hurricanes as the eighth seed in the 2005-06 Stanley Cup Final. Since then, they’ve shipped out most of their veteran players and drafted young talents like Taylor Hall, Jordan Eberle, and Ryan Nugent-Hopkins. Certainly three players of their magnitude should bring some playoff appearances – a feat that is yet to happen in this era of Edmonton Oilers. So as the core of their team has become younger and less experienced, the goal has not changed. It’s time to find a way to win in Edmonton with the nucleus that currently exists. 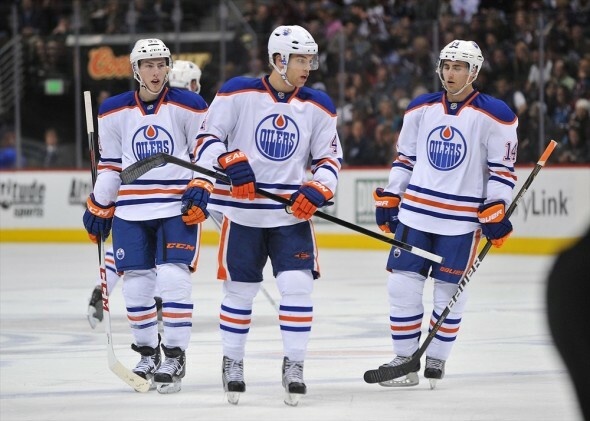 Regardless of their overall goal, the young Oilers certainly have career goals as well. Without the accomplishment of winning – to this point – some might be shocked to realize just how important guys like Hall and Eberle have been to the Oilers franchise. Whether it’s quietly putting up top numbers among left wingers or adding flare to a somewhat depleted lineup, their young talents have found a way to set personal marks in Edmonton. We all know stars of the Oilers from the 1980s – Wayne Gretzky, Mark Messier, Glenn Anderson and Paul Coffey to name a few. Those are the names that sit atop the Oilers’ all-time statistical lists. Some of them might never be touched. However, the current stars of the team might surprise you when you find out where they rank all-time in Oilers’ history. While some of them might not be in Edmonton for the long run, they are the closest to ‘The Great One’ when it comes to the top of Oiler greatness. Ben Scrivens (56) needs 3 games played to pass Jeff Deslauriers (58) for 15th on the team’s all-time goalie list. Jordan Eberle (108) needs 5 goals to pass Ethan Moreau (112) for 16th on the team’s all-time list. Taylor Hall (103) needs 6 goals to pass Jordan Eberle (108) for 17th on the team’s all-time list. Taylor Hall (254) needs 37 points to pass David Hunter (290) for 17th on the team’s all-time list. Jordan Eberle (250) needs 5 points to pass Taylor Hall (254) for 18th on the team’s all-time list. Taylor Hall (35) needs 2 powerplay goals to pass Bill Guerin, Jason Arnott and Esa Tikkanen (36) for 11th on the team’s all-time list. Jordan Eberle (27) needs 3 powerplay goals to pass Anson Carter (29) for 18th on the team’s all-time list. Taylor Hall (16) needs 2 game-winning goals to pass Ales Hemsky and Doug Weight (17) for 14th on the team’s all-time list. Jordan Eberle (16) needs 2 game-winning goals to pass Ales Hemsky and Doug Weight (17) for 14th on the team’s all-time list. Ben Scrivens (17) needs 4 wins to pass Jeff Deslauriers (20) for 15th on the team’s all-time list for wins. Ben Scrivens (2) needs 1 shutout to pass Ty Conklin (2) for 13th on the team’s all-time list for shutouts. NOTE: The ‘Game of Numbers’ series is subject to updates as the 2014-15 season progresses. Individual marks will only appear if the player is within 50 of the specific statistical milestone, while franchise marks only recognize the top 20 in club history. For more, follow Andrew on Twitter at @AndrewGForbes or his THW column at @Tape2TapeTHW.